Numbers up to 100! Here we go! We’ve had lots of fun exploring numbers to 100 on our hundred square and with numicon. This is a more close-ended activity to focus on whether children understand the link between the numerals and the quantity they represent. Some of the cards are quite tricky. The 32 card above has 23 as one of the ‘wrong answers’, which really explores whether the children are able to put the digits in the correct order. We have spent lots of time talking about numbers in terms of how many whole tens they have and how many more. The tens come first on these clip cards to reinforce this idea. My class see this as one of the trickier maths games as it has such ‘ginormous’ numbers, and so it is a firm favourite! 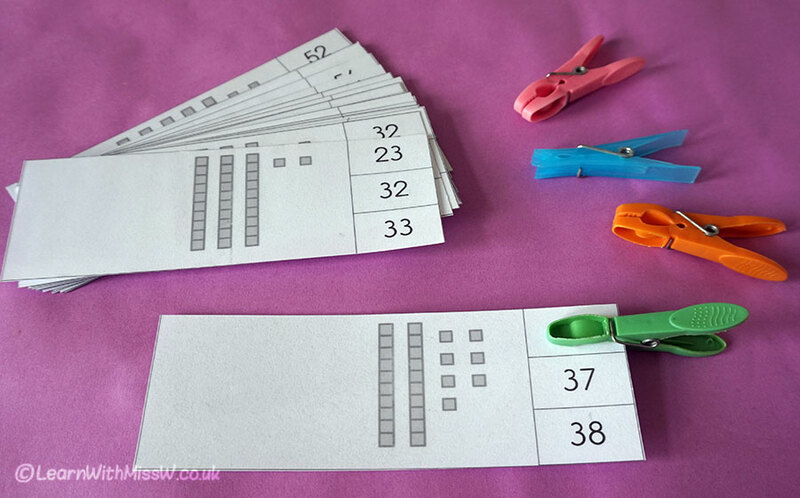 This tens and units activity is available to download and I also have tens and units bingo games for numbers to 50 and numbers to 100. Have fun!